My little girl, Ameli, is a serious live wire. We have to go out every day or do something to entertain her. She gets really frustrated and shrieks a lot if we don’t. At eleven months she’s still a little too young for most of the crafts in my box, but on a recent rainy day I decided to see what we could do with her. The results were almost as rewarding as the doing, she absolutely loved making soft drink rice rattles. Yes, you read that right! 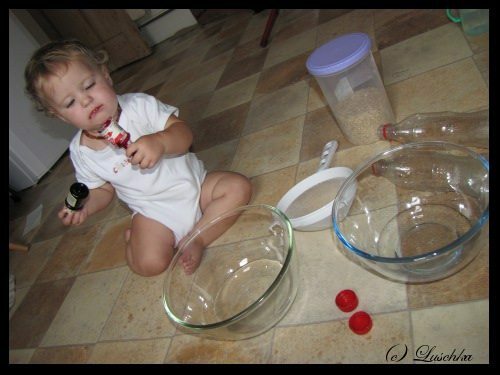 I took two empty 500ml soft drink bottles, a half cup of rice, food colouring, two mixing bowls, a sieve and water. 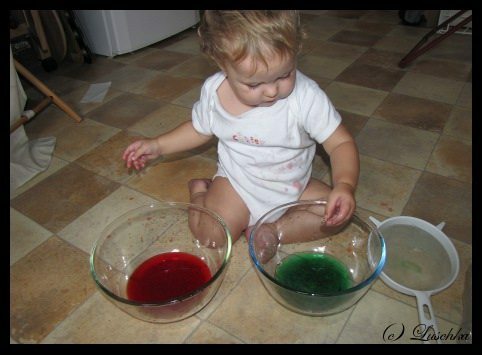 Mixing the water, food colouring* and rice in the two bowls, Ameli played in the water, splashing it around the kitchen floor for ages. She really enjoyed the play, which took up a large part of a rainy afternoon for us. Once she’d had enough, I sieved out the water and poured the rice in to the plastic bottles. Pop the lid on and shake, shake, shake! If we’d had a bit more patience we could have waited for the rice to dry first as it did stick to the sides of the bottle for a few days. Also, if the colours don’t take too well, add a drop of colouring in the bottle with the rice and shake it up. I know they’re not the most eco toys in her collection, but she walks around the house shake, shake, shaking and it makes me smile, remembering her splashing the coloured water â€“ and grateful that food colouring washes out! *You could use berries or beetroot for the food colouring too, and perhaps find a different bottle. I didnt want to use glass, but I’m sure there are better options than these – but it’s what we had on hand. I love your shakers! They are fabulous! So simple yet so effective!!! Love the colours too!! And THANK YOU for linking up with Kids Get Crafty 🙂 much appreciated!